The Gray Report: Do organically grown grapes still face a stigma? I am in Copenhagen this week and the buyer here would agree with you that the wines are both better in quality and for the earth. I personnally thinks is disingenuous for wineries to suggest they are organic without the certification. Organic is more than a concept. Organic is a promise to the consumer that they can trust in what you say is what you do. As the producer of over 100,000 cases annually of 'real organic wine' I enjoyed your interpretation of the article. you've got a couple of good points and at least one bad one. I like your last comment, focus on point one. The point I have to disagree on is the 'rotten wine' comment (obviously). It neglects the fact that all wine is 'rotten grapes', but implys that sulfites make it less rotten. I'll concede that early organic wine attempts were done by those with good intent, but not good training. The black eye given the niche still is with us in the prose of those like yourself who have been in the game a long time, but is outdated when you haven't kept current with the offerings in the 'organic wine' world. I much prefer the blogs of those with a few tatoos and piercings as they don't bring along the old baggage of dated opinion. My efforts are all done with central valley grapes so as much as I would tell you to go buy a bottle of 'Our Daily Red', I would really like to see some great Napa grapes made into an organic wine to see what is really possible. We're all in the dark at this point and a fair comparison isn't possible. Tim: Organic certification is expensive for small farmers. I understand what you're saying, but the certification process at present favors large factory organic farmers over the little guy. Tony: You'd like me better in tattoos with a tongue ring? In our view, this research is terribly flawed for its main hypotheses. Firstly, it makes the assumption that when wines are submitted to the WS that the Suggested Retail Price published is what people are paying for the wine, where actually the wine maker or marketing department merely submits what they hope to get for the wine; a big difference as one will easily find plenty of $40 wines on the shelves for $29. Secondly, there have been many well done studies that indicate that Appellation is by far and away the largest influence on price. Therefore, to make an even potentially reasonable comparison, it would have to by Appellation. Further Mendocino County has over a third of the certified organic grapes in the state. Yet most Mendocino winery owners understand they don't (possibly wrongly) have the cache of the Napa and Sonoma brands. Thus they price accordingly regardless of certified organic or not. Finally, I'd really wish that the myth perpetuated by the "I wanna gain any benefits there might be of marketing as organic (or 'I'm sustainable' - whatever that means? ), without really committing" winery crowd would die a fast and timely death. We've been certified as organic by CCOF for 24 years since 1986. I can state that it costs a couple thousand dollars, considerably less than any winery pays for their brochures tooting their horn. So it's NOT COST, it is commitment. Edward: Calm down. The study did compare by appellation. Moreover, SRPs were compared to SRPs. I don't know any more fair way of comparing prices, as wines made from all types of grapes can be discounted. Re certification: I'm just repeating what farmers have told me. I think for a big winery, a couple grand is not a big outlay, as you say. But I have had smaller grape growers tell me it's an expense that's hard to justify. That is only true if they cannot sell organically grown grapes for a premium price. If they cannot, then perhaps that is a better area for the study authors to look at. What are the prices per ton for organically grown grapes? I don't have the data on this, and I'd like to see somebody look into it. The report totals 42 Pages with 7 Tables and 2 Figures. Edward: Wow, 42 pages! That is long! My research fee is $100/hour, with a 2-hour minimum. Please let me know when the check is in the mail. If it had been read, there wouldn't have been the statement: "The study did compare by appellation." And you might have recognized that my main point is valid. Oh dear, I've got a Sarah Palin-type arguer on the website. You figure if you say something long enough, people will think it's true. Go to the report and search for the word "appellation." You might find phrases like "all models control for appellation and varietal." As I said, I didn't read every word. Glad that you caught the phrase, but it actually says "All Models include Varietal and Appellation fixed effects." My statistics aren't what they should be, but I believe that this phrase is just the way they ran the statistics. I looked for a comparison by appellation, as a rigorous study would have one; and this one doesn't. I intend to contact the authors, but I suspect the answer to that is that there were 160 appellations included (pg 20). And there were a mere 314 certified organic wines (pg 35); so on average less than 2 per appellation. Since only about 5% of Napa vineyards are certified organic and only about 2% of Sonoma vineyards are certified organic, this makes sense. And only about 2% in the state, likely only Mendocino with 20% certified organic might have yielded the 50 to 100 examples necessary to have some sort of statistically valid comparison. Thus, not likely they could have any valid statistical comparison by appellation. I propose you consider calming down. That was pretty quick verbal abuse. Will let you know what the authors have to say, as my main point is to make sure factual info is passed on to others. And some of the interpretations of this article have been way outside of that. Just found your blog and this post...I'm feeling lucky as this is informative, straightforward and helpful. Thanks! I just did a post on a 'Taste first' approach to organic wine. Strictly an opinion but you might find it a good read. If people actually knew what the impact of wine grape pesticides were - even in Napa and Mendocino counties - you bet your sweet bippy that there would be a RUSH to buy organically grown wines. Of course, the California Wine Institute would prefer not to discuss this topic and instead to have the public focus on solar panels (subsidized by the taxpayer with tax credits) and bird boxes and the occasional sheep. Just imagine that someone with a budget like them or the Napa Valley Vintners had put some communications dollars into messaging about organic. The industry doesn't want this to happen. If they had wanted it, they would have lobbied to change the labeling laws in the U.S. to be in alignment with the rest of the world - i.e. organically grown grapes = organic wine (and not the bizarre, myriad labeling laws we have in this country), we would have a lot more organically grown wine. Alas, most of the big four are addicted to chemical farming. The latest California Dept. of Public Health enviroscreen tool, released last week (see here http://cehtp.org/project.jsp?project_key=EHSS01) and the agricultural pesticide mapping tool that is available online from the same dept. have such powerful information in them that once people find out what is going on with wine grape pesticides, they might indeed freakout. Wine grape pesticides are a leading cause of the toxic soup we are all living in in California. In Germany, urban dwellers have been tested and without exception, subjects in a study in Leipzig, where found to have substantial amounts of Roundup in their urine - and these were not farmworkers or people who lived in agricultural areas. And DDT is still in the bodies of most everyone who lived in the DDT era. DDT doesn't go away. Bee colony collapse is being linked to many of the pesticides used in chemically farmed vineyards. And birds are definitely negatively impacted. 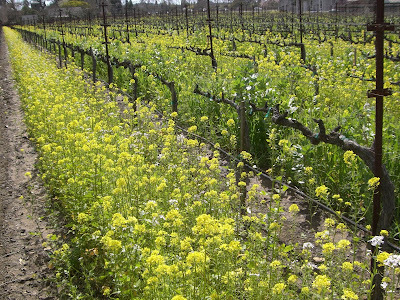 The lack of education about organically grown wine is not something that "just happened." It's part and parcel of a giant industry that doesn't want it to make it look bad by comparison. But unfortunately, this industrial type of wine grape growing is now spreading to all the other states outside California that are beginning to grow wine grapes.